Joins Kuhn, Loeb & Co.
Family of Frankfort-on-the-Main, Germany. The earliest known member, Jacob Kohen Ẓedeḳ Schiff, who is mentioned on the tombstone of his son, Uri Phoebus, as having discharged the function of dayyan at Frankfort-on-the-Main, must have been born about 1370, the earliest date to which any contemporary Jewish family can be definitely traced. Uri Phoebus Schiff attained a great age, as his tombstone mentions, and died 1481; he must, therefore, have been born about 1400. The name occurs on one of the signs of the Judengasse as early as 1613: in Middle High German the word "schiff" means a vial and may have been used as the sign of an apothecary or physician. The next member of the family mentioned is Meïr Kohen Ẓedeḳ Schiff, referred to as parnas of the community, who died in 1626. The family has intermarried with the Adlers, Oppenheims, Wertheimers, Günzburgs, Geigers, Glogaus, Mannheims, and Hanaus, and one member married a cousin of Zunz. 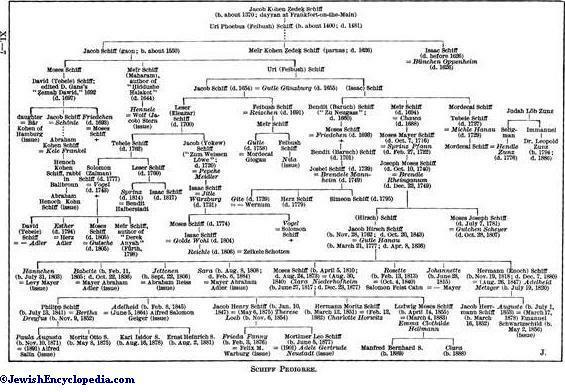 A step-grandfather of Heine was named Schiff, though of a branch of the family settled at Hamburg. 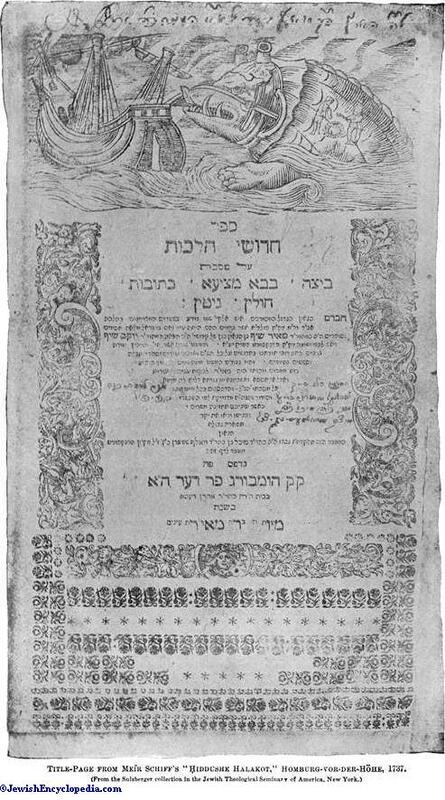 Among the rabbinical authors included in the family are Meïr ben Jacob Schiff, known as Maharam Schiff (d. 1644); David Schiff, editor of the "Ẓemaḥ Dawid"; and Tebele Schiff, chief rabbi of the Great Synagogue, London (1765-92), and author of "Leshon Zahab." The most distinguished recent member is Jacob Henry Schiff, banker and philanthropist, of New York. A pedigree of the family appears on page 97, the feminine names being given in italics. A. Ullmann, Familienregister des Jacob Hirsch Schiff und Seinen Nachkommen, privately printed, Frankfort-on-the-Main, 1885. J.Jacob Henry Schiff: Joins Kuhn, Loeb & Co.
American financier and philanthropist; born Jan. 10, 1847, at Frankfort-on-the-Main. 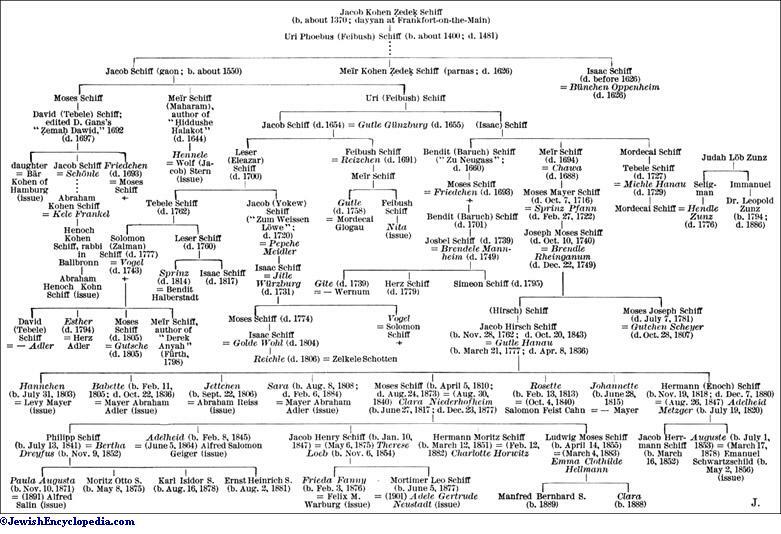 He was educated in the public schools of Frankfort, and adopted the vocation of his father, Moses Schiff, one of the brokers of the Rothschilds in that city. In 1865 he emigrated to the United States, and was employed for a time by the firm of Frank & Gans, brokers, New York. In 1867 he formed the brokerage firm of Budge, Schiff & Co., which was dissolved in 1873. He then went to Europe, where he made connections with some of the chief German banking-houses. Returning to the United States, he became on Jan. 1, 1875, a member of the banking firm of Kuhn, Loeb & Co., New York, of which he was soon practically the head. Owing to his connection with the German money market, Schiff was able to attract much German capital to American enterprise, more particularly in the field of railway finance. His firm, under his direction, became the financial reconstructors of the Union Pacific Railroad about 1897; and in 1901 it engaged in a struggle with the Great Northern Railway Company for the possession of the Northern Pacific Railway; this resulted in a panic on the stock exchange (May 9, 1901), in which the firm of Kuhn, Loeb & Co. held the situation at its mercy. Schiff's moderation and wise action on this occasion prevented disaster, and caused his firm to become one of the leading influences in the railway financial world, controlling more than 22,000 miles of railways and $1,321,000,000 stock. To him was largely due the establishment of the régime of "community of interests" among the chief railway combinations to replace ruinous competition, which principle led also to the formation of the Northern Securitics Company. Schiff's firm was chosen to float the large stock issues not only of the Union Pacific and allied companies, but also of the Pennsylvania Railroad, the Baltimore and Ohio, the Norfolk and Western, and the Missouri Pacific railway companies, the Western Union Telegraph Company, and many others. It subscribed for and floated the three large Japanese war loans in 1904 and 1905, in recognition of which the Mikado conferred upon Schiff the Second Order of the Sacred Treasure of Japan. He was also received in private audience in 1904 by King Edward VII. of England. Schiff is connected with many industrial and commercial activities. He is a director of the Union Pacific, the Baltimore and Ohio, the Chicago, Burlington and Quincy railway companies; of the Western Union Telegraph Company; of the Equitable Life Assurance Society; of the National Bank of Commerce and the National City Bank, the Morton Trust Company, the Columbia Bank, the Fifth Avenue Trust Company of New York; and of various other trust companies in New York as well as in Philadelphia. Schiff has especially devoted himself to philanthropic activity, both general and Jewish, on the most approved modern methods. Besides making benefactions in his native city he was one of the founders and has been ever since president of the Montefiore Home, New York, and is one of the two persons connected with all the twelve larger Jewish charities of that city. In New York also he has presented a fountain to Seward Park, has given a house in Henry street to the Nurses' Settlement, has helped to establish social settlements on the East Side, and has provided a building for the Young Men's Hebrew Association. He has also been a trustee of the Baron de Hirsch Fund from its inception, as well as of the Woodbine Land and Improvement Company. All the municipal reform movements in New York likewise have been supported by Schiff; he served on the Committee of Seventy (1898), the Committee of Fifteen (1902), and the Committee of Nine (1905); and he has recently founded at Columbia University a chair in social economics. His interest in education and learning has found expression in the establishment of scholarships at Columbia for economic science, and in the presentation of a fund and building for Semitic studies at Harvard (see Semitic Museum). He is chairman of the east-Asiatic section of the Museum of Natural History, New York, which has sent out many expeditions for the study of Eastern conditions and history. He has made many donations to the Metropolitan Museum of Art in that city and to other museums, as well as to the Zoological Gardens in Bronx Park, of which he is a trustee. Schiff has been connected with the Reform wing of Jewish religious activities, and is a trustee of Temple Beth-El, New York. Nevertheless, he has taken great interest in the expansion of the Jewish Theological Seminary of America, to the sustentation fund of which he has contributed largely, and to which he has donated a special building. He has also presented to the New York Public Library a large number of works dealing with Jewish literature, so that it now possesses the largest collection of modern Judaica in the New World. Schiff is the author of the "Report on the Currency of the Finance Committee of the New York Chamber of Commerce," 1903. Jewish Guardian, Aug. 28, 1903. German rabbi and scholar; born at Frankfort-on-the-Main 1608; died about 1644 at Prague. 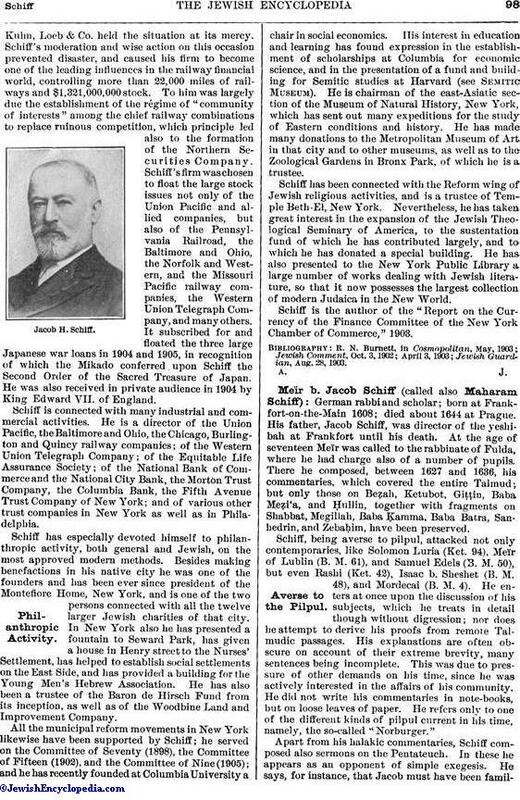 His father, Jacob Schiff, was director of the yeshibah at Frankfort until his death. At the age of seventeen Meïr was called to the rabbinate of Fulda, where he had charge also of a number of pupils. There he composed, between 1627 and 1636, his commentaries, which covered the entire Talmud; but only those on Beẓah, Ketubot, Giṭṭin, Baba Meẓi'a, and Ḥullin, together with fragments on Shabbat, Megillah, Baba Ḳamma, Baba Batra, Sanhedrin, and Zebaḥim, have been preserved. Schiff, being averse to pilpul, attacked not only contemporaries, like Solomon Luria (Ket. 94), Meïr of Lublin (B. M. 61), and Samuel Edels (B. M. 50), but even Rashi (Ket. 42), Isaac b. Sheshet (B. M. 48), and Mordecai (B. M. 4). He enters at once upon the discussion of his subjects, which he treats in detail though without digression; nor does he attempt to derive his proofs from remote Talmudic passages. His explanations are often obscure on account of their extreme brevity, many sentences being incomplete. This was due to pressure of other demands on his time, since he was actively interested in the affairs of his community. He did not write his commentaries in note-books, but on loose leaves of paper. He refers only to one of the different kinds of pilpul current in his time, namely, the so-called "Norburger." Title-Page from Meïr Schiff's "Ḥiddushe Halakot," Homburg-vor-der-Höhe, 1737. Apart from his halakic commentaries, Schiff composed also sermons on the Pentateuch. In these he appears as an opponent of simple exegesis. He says, for instance, that Jacob must have been familiar with the explanation of Gen. xxv. 33 given by Rashi (B. Ḳ., end). Of the sermons only a fragment on Deut. iv. has been preserved. A mnemonic index to the Bible and the Talmud by him is also extant. In 1636 he removed to Schmalkalden; he was called to the rabbinate of Prague shortly before his death. On his death-bed Schiff is said to have called his daughter Henlah and told her to keep all his works in a box until one of his younger relatives should be able to study and publish them. Henlah sent the box containing the works to a strange house, where they became moth-eaten, and some of them were stolen; so that her son, Michael Stein, came into possession of only a remnant of them, which he finally published, probably in 1737, at Homburgvor-der-Höhe under the title "Ḥiddushe Halakot." A second edition appeared there in 1757; and both were full of misprints. The first revised edition was published by Mordecai Markus of Polozk in 1810. 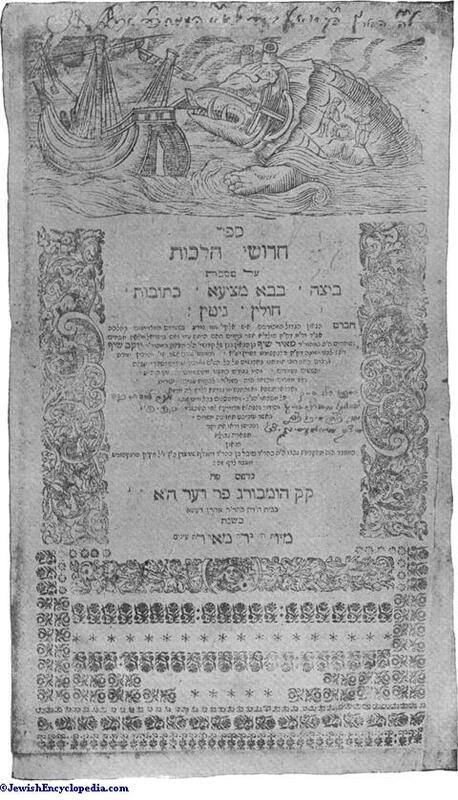 It has been the model for Talmudic study, and a copy is often given as a prize to students who have distinguished themselves in the study of Ḥiddushim. Most of Schiff's notes on the four Ṭurim, as well as his cabalistic works and Talmudic decisions, were destroyed during the conflagration at Frankfort-on-the-Main in 1711. Benjacob, Oẓar ha-Sefarim, p. 179. German biologist; born at Frankfort-on-the-Main 1823; died at Geneva Oct. 6, 1896. He was educated at the gymnasium and the Senckenbergsche Institut of his native town and at the universities of Heidelberg, Berlin, and Göttingen (M.D. 1844). In Heidelberg he studied under the anatomist Tiedemann, whose lectures had a great influence upon him and who led him to take up the study of biology. After a short postgraduate course in Paris he returned to Frankfort, where he was appointed chief of the ornithological department of the zoological museum. Schiff took an active part in the Baden revolution of 1849, being surgeon to the rebel army under the son of his former teacher, Tiedemann. After the capitulation of Rastatt he went to Göttingen, where he sought admittance to the medical faculty of the university as privat-docent; but the Hanoverian government refused to appoint him on the ground that his liberal views were "dangerous to students." He then went to Switzerland, where he was appointed professor of comparative anatomy at the University of Bern, which position he held from 1854 to 1863. In the latter year he was called to Florence as professor of physiology at the Istituto di Studii Superiori. He remained there till 1876, when he was made professor of physiology at the University of Geneva, which chair he continued to occupy till his death. Schiff was one of the leading biologists of the nineteenth century, although in later years he devoted his attention almost entirely to physiology, especially the Physiology of the construction and changes of the nerves. 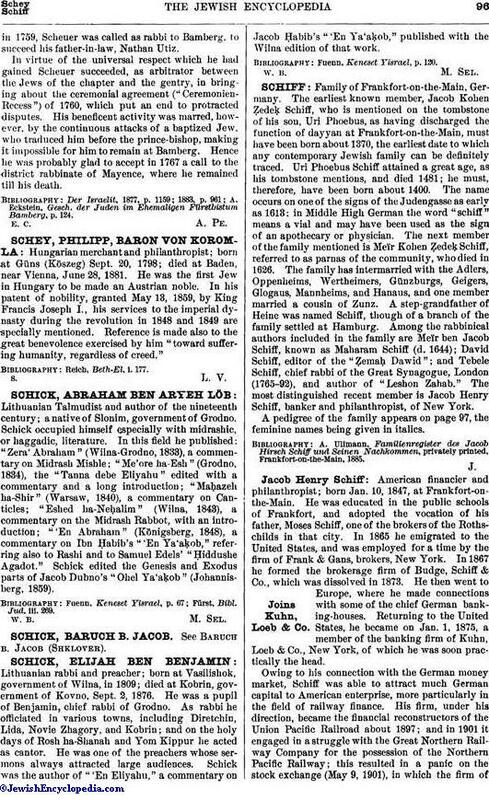 He contributed numerous monographs to the scientific journals, and from 1862 was one of the editors of the "Schweizerische Zeitschrift für Heilkunde." He was, besides, a collaborator on Prince Lucien Bonaparte's "Conspectus Avium," in which he described the fauna of South America. Of his works may be mentioned: "Untersuchungen zur Physiologie des Nervensystems mit Berücksichtigung der Pathologie," Frankfort-on-the-Main, 1855; "Muskel- und Nerven-Physiologie," Lahr, 1858-59; "Untersuchungen über die Zuckerbildung in der Leber und den Einfluss des Nervensystems auf die Erzeugung der Diabetes," Würzburg, 1859; "Sul Systema Nervoso Encefalico," Florence, 1865 (2d ed. 1873); "Lecons sur la Physiologie de la Digestion," Berlin, 1868; "Sulla Misura della Sensazione," Florence, 1869; "De l'Inflammation et de la Circulation," Paris, 1873; "La Pupille Comme Esthesiomètre," ib. 1875. Kussmaul, Jugenderinnerungen eines Alten Arztes, 5th ed., pp. 198, 199, 248, Stuttgart, 1902. German chemist; born at Frankfort-on-the-Main July 25, 1854. He received his education at his native city and Florence, and then at the universities of Heidelberg and Zurich, graduating as Ph.D. in 1876, when he became assistant to Professor Canizaro in Rome. In 1878 he received the "venia legendi" at the University of Rome, and in 1879 was appointed professor of chemistry in the University of Modena. In 1892 he was called to a similar chair in the University of Pisa, which he still holds (1905). 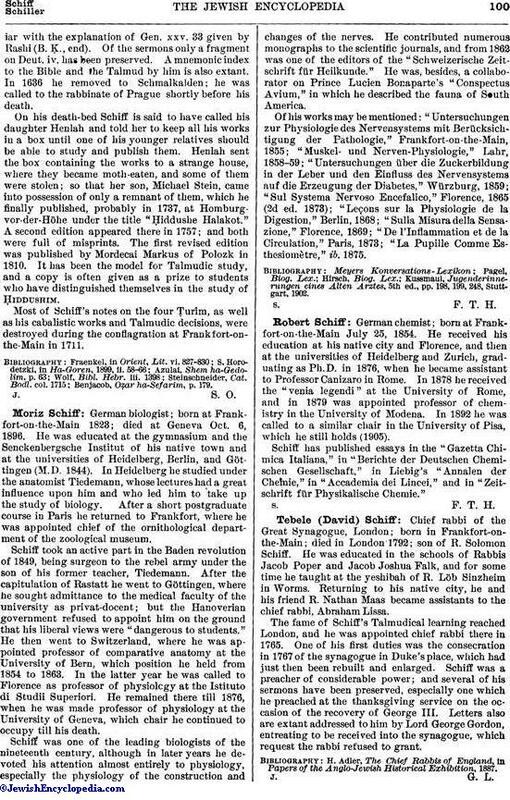 Schiff has published essays in the "Gazetta Chimica Italiana," in "Berichte der Deutschen Chemischen Gesellschaft," in Liebig's "Annalen der Cheimie," in "Accademia dei Lincei," and in "Zeitschrift für Physikalische Chemie." Chief rabbi of the Great Synagogue, London; born in Frankfort-on-the-Main; died in London 1792; son of R. Solomon Schiff. He was educated in the schools of Rabbis Jacob Poper and Jacob Joshua Falk, and for some time he taught at the yeshibah of R. Löb Sinzheim in Worms. Returning to his native city, he and his friend R. Nathan Maas became assistants to the chief rabbi, Abraham Lissa. The fame of Schiff's Talmudical learning reached London, and he was appointed chief rabbi there in 1765. One of his first duties was the consecration in 1767 of the synagogue in Duke's place, which had just then been rebuilt and enlarged. Schiff was a preacher of considerable power; and several of his sermons have been preserved, especially one which he preached at the thanksgiving service on the occasion of the recovery of George III. Letters also are extant addressed to him by Lord George Gordon, entreating to be received into the synagogue, which request the rabbi refused to grant. H. Adler, The Chief Rabbis of England, in Papers of the Anglo-Jewish Historical Exhibition, 1887.